Fashion is at the heart of our business and our solutions are tailored to the specific needs of your business. From watches to boots, we have deep domain expertise within the apparel industry. What is SAP Business One for Apparel and Footwear? A powerful yet cost-effective solution, SAP Business One for Apparel and Footwear brings together all business-critical functions, streamlining processes and giving you a deeper insight into your business. Providing easy access to company data at any time, in any place, via intuitive tools and reports, SAP Business One for Apparel and Footwear enables you to make better, faster decisions, dramatically improving business agility and making a real difference to your company's profitability. SAP Business One for Apparel and Footwear provides a comprehensive range of tools to manage your financial operations. By handling all financial transactions, including general ledger, account setup and maintenance, and budgets, as well as taking care of all financial processing such as cash receipts, advance payments, and bank reconciliation, the software enables you to take full control of your finances. The solution can make a real difference to your sales and distribution processes, too, helping you to create price quotes, enter customer orders, set up deliveries, update inventory balances, and manage all invoices and accounts receivables. SAP Business One for Apparel and Footwear can maintain vendor contracts and transactions, including issuing purchase orders, updating in-stock numbers, calculating the value of imported items, handling returns and credits, and processing payments, streamlining operations for major efficiency savings. By managing the entire sales process and customer journey, SAP Business One for Apparel and Footwear can make a real difference to your business’ CRM. The software records every sales opportunity, from the first phone call to the successful close of a transaction, while controlling all information about customers, resellers, and vendors, including profiles, contact summaries, account balances, and sales pipeline analysis, as well as taking care of service operations, contract management, service planning, tracking of customer interaction, and customer support. For ultimate flexibility, the system enables users to run from single to multi-store or prepack orders using a horizontal matrix entry, as well as generating price quotes, entering customer orders, setting up deliveries, updating inventory levels, reporting on customers' current balances, and managing all billing and accounts receivables. For ultimate efficiency, SAP Business One for Apparel and Footwear provides an end-to-end systematic approach to the procurement process. It manages and maintains your vendor contracts and transactions, including the issue of purchase orders, updates to inventory quantities, calculations for the value of imported items, returns and credits, and payment processing. With SKU and Bill of Material complexity a common challenge for apparel businesses, SAP Business One for Apparel and Footwear enables you to manage your data at the end item level to successfully forecast, plan, and manufacture products, delivering the right product and controlling your inventories. The solution takes away common inventory management problems by taking care of inventory levels, item management, price lists, special price agreements, transfers between warehouses, and inventory transactions, all via integration with other key processes such as sales and purchasing, taking your inventory management to the next level. SAP Business One for Apparel & Footwear facilitates the effective management of products, from design all the way through production, speeding up your innovation as well as your ROI. The integrated Product Data Management application manage images, colors, materials and POMs, with the ability to add sketches, concepts, documentation and images to the style from a file or an existing drawing tool, all while the system manages raw materials and labor costs. The built-in web PLM functionality enables users to manage styles, colors and materials online, generating and tracking requests, purchase orders, and critical path activities, with the ability to give employees and vendors access to the same data in real time. By taking full advantage of online working, SAP Business One for Apparel and Footwear provides a fully-functional web presence for your sales employees and users. Representatives can enter and track orders, shipments and invoices, as well as accessing customer and style information, while your customers can access season styles. And, through the apparel merchant and ecommerce experience, your customers can choose from an abundance of styles, colors, and other variables in a flexible yet intuitive web store. In the fashion industry the immediacy and accuracy of the Collection can make a big difference. With SAP Business One for Apparel and Footwear, the fashion book presentation is still controlled entirely by merchandising staff at the fashion house but it delivers accurate collection information taken directly from the system, including style and color options and that all-important real-time inventory availability, all presented to the customer in a visually appealing, highly intuitive application on a tablet device. SAP Business One for Apparel and Footwear takes care of the entire manufacturing process. 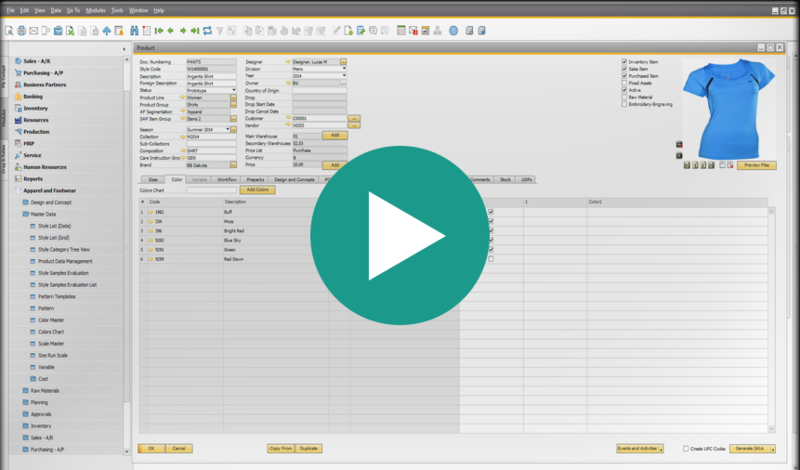 It manages Material Requirements Planning (MRP) through a wizard-based process that enables users to define a planning scenario and predict demand based on forecasts. The addition of advanced warehouse management functionality increases efficiencies further still, and, for maximum flexibility, the solution’s manufacturing functions include specific strategies for materials management, such as order and inventory related production, mixed and variant production. Advanced Planning and Scheduling (APS) is used for detailed planning, automatically factoring in order times, lead times, transition periods, capacity allocations, and availability of resources, all presented in an easy-to-use graphical format for users to easily identify if any intervention is required. The provision of powerful analytics and reporting tools means that SAP Business One for Apparel and Footwear can create reports for nearly every aspect of your enterprise, including customer and vendor debt, sales, cash flow, customer-contact summaries, bookkeeping, warehouse inventory, financial statements, pricing, and customer activity. This enables you to benefit from insightful, real time and accurate reports for unsurpassed levels of business clarity.